S-Pulse cruised to victory in the Nabisco Cup group stage without ever really stepping out of second gear. A gorgeous Sunday afternoon was the setting for one of our bigger Nabisco crowds (11281), and given how few came up from Kyoto, one of the best home fan turn outs for this competition. It was a good game. I think. It was a good, solid performance all told. Positive going forward, and at times sweeping through the Kyoto midfield and defence with real verve. Saying that, we had trouble getting past Kyoto's giant number three, Sidiclei, which was where many of our attacks came to shuddering halt. We made 15 shots, and forced 9 corners. Kyoto's 16 goal kicks also bares testament to our positivity going forward, although we, and I get tired typing this every week, really should have made more of many of our opportunities. A good number of Kyoto's chances came off the back of errors whereby we gave possession away far too cheaply, something stronger teams would have punished us for. Still, it'd be a little churlish to focus on the negatives in what was a strong offensive display with the result never really in doubt. Junpei scored an absolute peach just before half time to stake a claim for a return to regular first team football, and Edamura put the finishing touch on another sweeping attacking move down the right wing midway through the second half. Johnsen is aching to bag his first goal, and he very nearly got it today. It took a split second reaction save from Mizutani in the Kyoto goal to deny him. Frode also appeared a lot more involved generally, dropping much deeper to help win the midfield battle instead of merely being left up front waiting for long balls hoofed forward, as per the Marinos game. Special mention to Iwashita, who was solid as a rock in defence and always dangerous at corners. A very good performance from our man at the back, and he matched that of Kyoto's Sidiclei in stopping attacking moves. He's coming on in leaps and bounds, and the departed Takagi's absence is all the more unnoticeable for it. 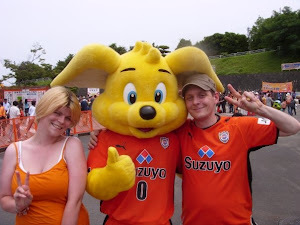 Our 2009 Nabisco campaign is off to a good start, and if we can get three points against the not-to-be-underestimated Yamagata in May, we'll have done the lion's share of the work in getting through to the knock out stage. See the bar on the right for current standings in our group, or click here for a little more depth. In summary then, beautiful weather, a good result, daytime fireworks, two Loco Locos, and I met one of the fanzine's youngest readers! Why can't all Sundays be this nice? Click here for some official pictures of the game, and directly below are extended highlights. This is a personal cam and not TV coverage. 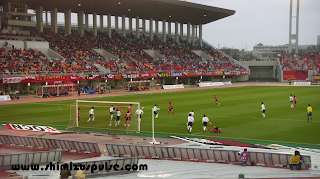 Match day two of the 2009 Nabisco Cup is upon us! Being match day two, you may be wondering what happened to our match day one. Well that was on Wednesday, and due to the weird and wonderful way the competition is organised this year, we didn't have a game. For those not in the know, this year's League Cup group stage is split into two groups of seven. We're in Group B along with Kashiwa, FC Tokyo, Chiba, Yamagata, Kyoto and Kobe. Teams play each other once with three games at home, and three games away. Who's at home for which game was all down to the fixture computer. Have a look here for our full group stage fixtures. Having three match ups each time means once team gets a day off. We got lucky not having to play on a chilly Wednesday evening, instead getting a clear blue sky and warm 12 degree afternoon for our début game in this year's competition. As is common with the league cup, tickets are still in plentiful supply, with only around 12000 sold so far. Saying that, 12000 would still be one of our better league cup crowds, so bring it on! As for team news, Okazaki is in Saitama with the national team (as I type, he's probably warming up) for the visit of Bahrain in the World Cup qualifier. Because of that, expect to see Hara starting up front. I'm wondering if Kenta will give Johnsen a rest tomorrow, perhaps giving Genki his first start. We may also see a start for Jungo. He's been on from the start in the reserves, but hasn't racked up a full 90 minutes yet, but that'll come in time. Aside from that, let's just hope we can secure our first home goal, and three points, of the season! We're yet to win this year, but I think we were unlucky against a strong Nagoya team last week. We played some nice stuff, and I think we've got a whole lot of goals inside us just aching to get out. Expect some tomorrow! We turned over Tokyo 3-1 in the same fixture last year on our road to the Kokuritsu, and while the run was glorious, the less said about the final, the better. All the more reason to win it this year! One More Time to the National Stadium, Please! Kick off 1pm, so I'll see you there! One the Shinkansen to Nagoya last Sunday, I was listening to the new Prodigy album. The title track struck me instantly as one that might make a good backing track to a goal compilation video. So I made one. :) It's a tribute not just to the team, but also to our legions of supporters - the best in the league! Making this video reaffirmed to me just how talented our Hara is, and also how important Kazuki is to us as team. I'm looking forward to making another video at the end of this season with many more of his cracking goals and assists in it. And there it is - our first league defeat since November 8th, 2008. Yep, it hurts. Yes, the floodlights were on and it's wasn't even one o'clock! A grey, overcast March afternoon was the backdrop for today's Tokai Derby, which was somehow in character for the host town. Nagoya has come over as a grey, overcast type of a city every time I've been. A kind of Japanese Coventry, if you will. Of the 2.2 million locals, only around 12000 had football on their minds today, with a good thousand travelling up from Shiz. 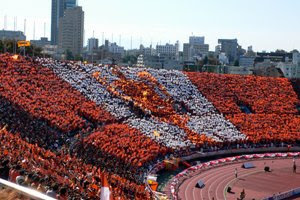 Despite being three times the size of Shizuoka, Nagoyans don't turn out in great numbers for their team. Their average crowds are pretty much on a par with S-Pulse's, which given their huge catchment area, and the ease of access to Mizuho Stadium, is surprising. It's also a shame, as they're a decent team who can play some nice stuff. Today was a good example of what the locals are missing out on - an actioned packed game which, sadly for me and the the hundreds of Shizuokan's who had made the trip, ended in a home win. So 3-1 to them, and Pixie's reaction after his side's 2nd goal summed up a lot about today's game. Despite the reds holding a deserved half time 1-0 lead, we had Nagoya on the rack for a long, drawn out period in the second half. We were playing some fluid, fast-paced football and were scything through the home team creating chance after chance. We went close several times, hitting the bar twice. When Grampus caught us with a counter on 76m which took our flat-footed defence apart to go two up, the Nagoya bench knew they'd got off the hook and pushed the game almost out of reach. That wasn't quite the whole story, though, as we went up the other end four minutes later to grab one back. It was a brilliantly placed header from Okazaki which put us back in it on 80 minutes, but try as we might (and we did) we couldn't get though to make it all square. Last season, we praised Nagoya for their unwillingness to use time wasting tactics to run the clock down, but with the marauding whites of S-Pulse throwing everything at the home goal, that was not a mistake they were about to make this year. The last ten minutes were roughly divided between tearing the ball away from red strikers who ran it time and again into the corner, and tearing our hair out as the substituted Nagoya players took disgustingly long to drag themselves off the pitch. Well, yeah, maybe that's all part of the game, but it does display a certain lack of class, not to mention leave a slightly sour taste in the mouth. After missing out on any silverware last year, I get the impression Nagoya are not about to let anything so tiresome as decent sportsmanship get in the way of their first title in ten years. It was with a weary sense of inevitability that Davi went down in a rolling heap in the box in the 3rd minute of stoppage time. Iwashita had lost his footing and fell over into the Brazilian, and there wasn't a cat in Hell's he wasn't going to make the most out of it. Duly dispatched - 3-1 to them. I wanted to see Paulo start ahead of Yamamoto, but it wasn't to be. Yamamoto was taken off on 67 for the dropped Edamura. Hara started in his place. Jungo was on again as a sub, and he smashed one back off the bar within seconds of coming on. The sooner he's starting, the better. Nagoya looked dangerous at times, and Davi is a deadly striker for sure, so I'm going to stick my neck out and predict a top two finish for the reds this season. We can take a lot from today, though. We gave them the run around in the second half, and with a little luck would have been on level terms before they doubled their lead. We were playing the type of good football we're known for, and crafting some nice chances. Out fans were far from distraught at the end, and despite the loss, I'm confident good times are just around the corner. I would say watch out to Kyoto next week as someone is due a hiding, but they just beat Gamba 2-1, so who really knows what's going to happen in this league!? Bonus Feature - Star Spotting! After the game we headed into town to get something to eat, and who should we bump into? Only Seiko Matsuda's daughter, Sayaka Kanda! It's time for a news digest! Our opening match of this year's satellite league ended in a 2-1 defeat at the hands of Marinos. 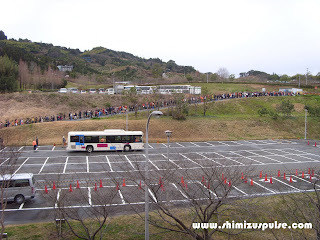 The game took place Sunday 15th March at Yokohama's MM21 training centre, and attracted a crowd of 1069. Our goal scorer was recently returned Jungo Fujimoto, who scored the goal of his life (maybe) by beating the entire Marinos team (possibly) before nutmegging the hapless keeper (perhaps). Jungo played an hour before being taken off for Genki. Our soon-to-turn-20 year old Korean, Kim Dong-Sub, was called up this week for the Korean national team (U20). He's off with them between March 16th and April 5th. Also called up this week was Okazaki. He's been included in the squad which will face Bahrain in Saitama on the 28th of March. The game is part of the 2010 World Cup qualifying campaign. See here for latest group standings. 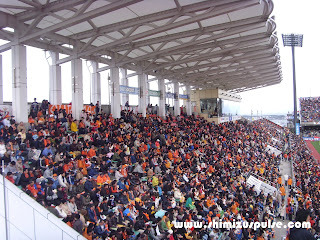 Week two, our first home game of the season, over 19000 packed in to Nihondaira, and what do they get treated to? A goal-less draw. Darn. It was a game of two halfs, with us looking distinctly under the kosh for the first 45. We spent a lot of it in our own half, and Marinos were by far the more likely to score. We lost possession far too easily and there was not a great deal to cheer about for the packed S-Pulse end. Saying that, we did manage to hit the woodwork before the break, when we clearly had a good dressing down from Kenta. The second half we looked a lot better, but the 3-4-3 played by Marinos was in reality 5-2-3 with the wingers playing so deep we were very effectively restricted in getting down the wings. Each long ball hoofed up front was met by groans from those around me, and it wasn't until Yamamoto was taken off for Paulo on 56 that we started to show some decent direction and purpose in our play. He didn't put a foot wrong, and the whole mood of the game changed with his introduction. I would have had him start ahead of Yamamoto even before this game, and after yesterday, I'm going to very surprised if he's not in he starting eleven against Nagoya next week. Hara, brought on for Okazaki on 76, continued to justify his last year young player of the year short-listing by doing what he does best: running fearlessly at defenders. He went very close to grabbing a winner, and if the game had been 100, not 90, minutes, we would have probably found a way through. Alas, 90 minutes is all you get, and it took us an hour to start threatening the visitors, so we've only ourselves to blame. In a day where the subs stole the show, Jungo was given a rapturous reception when he was introduced on 82. 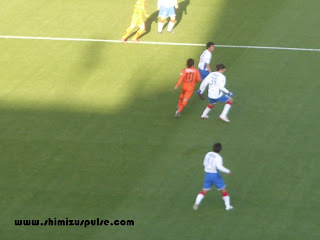 We were there when he broke his leg at Omiya last July, so it was fantastic to see him back in action. He was only on for 10 minutes, but he looked sharp and has clearly missed his football. The sooner he's back as a starting member the better. He has a real hunger and energy about him which we've dearly missed. Welcome back Jungo! Johnsen appeared a separate entity to the rest of the team, but any new signing takes a while to gel, so it's way too soon to be getting worried yet. The fact we didn't find the net was far more about a lack of decent service than anything else. The Norwegian'll come good given time, and it'll coincide perfectly with better service from the wings. Saturday was frustrating to say the least, but again, I don't see any cause for panic. The booing at the end of the game was a little bit much in my opinion, especially when you put our opening results in context. We drew 0-0 with Marinos and Omiya, and while Marinos had scored twice in their previous game, Omiya scored three times today. It's still too early in the season to be making too much of such stats, but we've not yet conceded, and that makes us the only team in J1 with none against. Compare that with Jubilo, who have conceded ten, count em, TEN goals in two games. So in summary, for next week, I expect a starting 11 not too much unlike yesterday, but I do want to see Paulo in from the start. Over to you, Kenta. The second highest crowd of the day, no less. A real mixed reception at the end of what was a pretty frustrating game. It’s here! It’s finally here! Three and a half months after our last competitive match down ‘Daira way, Saturday at last sees us back in business. 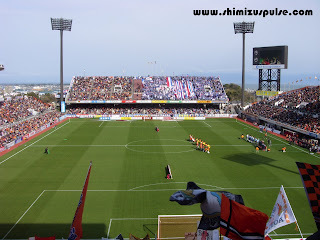 In match day two of 2009, we welcome Yokohama F. Marinos (don’t forget the F) to the newly christened Outsourcing Stadium Nihondaira. Yokohama are no doubt still smarting from getting turned over 4-2 at home by newly promoted Hiroshima, but they really shouldn’t feel too bad about it. It could have been worse, after all. Hiroshima are still riding the wave that started back in March 08 with their Xerox Super Cup victory, and swept them relentlessly on to the J2 title. With 100 points and 99 goals, they were 22 points clear of Yamagata with an incredible +64 goal difference. I doubt anyone would have fancied taking them on last week. With Marinos playing 3-4-3, it's no big surprise they managed a couple of goals against what is still in effect a J2 defence. But it also goes some way to explain how a stronger team could dictate midfield and overwhelm their three man defence. Word over at the wonderfully professional looking Tricolor Pride, laments the way Hiroshima pulled Marinos all over the pitch, and if we play the fast-paced passing game we're more than capable of, we'll be able to capitalise on the extra space down the flanks to get those crosses into Okazaki and Johnsen. Last Sunday was a frustrating way to start the season. 17 shots should have reaped better rewards, but all things considered, a draw was fair. Rustiness in front of goal meant we saw some excellent chances go begging. I’m confident we can win the midfield battle on Saturday which will give opportunities for the the likes of Edamura and Okazaki to get back to their deadly best. I'm not expecting a starting eleven much different to last week. In helping promote our club, Shizuoka City have really been going for it over the last couple of years. Working with S-Pulse, I doubt there's a person left in town unaware of the game on Saturday! We're set to top last year's gate of 18292 for this fixture, and not only that, 'Daira will be rocking to quite possibly our largest ever opening weekend crowd. At the time of writing there’s only around 1000 tickets left, so if you’ve not got yours yet, don’t count on paying on the day – get one now! One final word - don't forget your mac, cos like last year, it might be wet! Good news! While the rain is set to hammer down all night, according to latest weather reports it'll clear up late morning and we'll be blessed with a clear blue sky with which to kick off our 2009 home campaign. Three months with no competitive games can do the funniest things to you. 17 shots for S-Pulse, but not one found it's way through, and a hefty percentage weren't even close. No cause for panic though. Both teams had chances, but neither could capitalise. Both teams had wobbly moments at the back, but neither were punished. The sell out crowd was entertained, but both sets of fans probably left feeling unfulfilled. It was just one of those games. Johnsen and Okazaki are going to take time to time to forge an effective striking partnership. Nishibe was back in the starting eleven, and to be fair to him, he dealt more than adequately with Omiya's handful of shots. Omiya did a good job of restricting us when it came to getting down the flanks, and we looked most dangerous on the counter. Next Saturday, in front of a quite possibly sold out Nihondaira, will be the time to put it together. The time for reacclimatising to competitive football is over, and the time for getting a higher percentage of those 17 shots at least on target is here! All football fans occasionally have times where they wonder why they bother. You can only put up with a certain number of dreary goal-less draws before you feel your commitment start to waver. The effort a fan puts in over years of trudging off to stadiums far and wide is rarely repaid by games of pulsating, edge-of-your-seat excitement. But every now and again, there comes a match. A match which reminds you why you love the game. Today was just such an occasion. New boys Montedio Yamagata made their first ever top flight appearance down Shizuoka way against Jubilo Iwata - three times J1 champions. 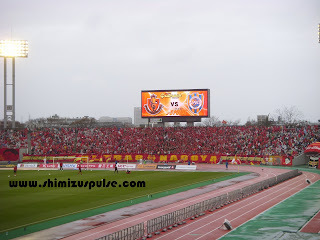 A game almost universally predicted as a home win, as I left my flat into the bitterly cold winds whipping in from Suruga Bay, I almost had second thoughts. Almost, but not quite. And I'm so glad I didn't. By no means a work of art, the game had guts. The game had fight. And the game had goals. Eight, yep, that's right, eight of 'em. From Gilsinho's theatrical dive which gave Jubilo an undeserved penalty on 17 minutes, to the two goals for Yamagata right at the end which capped their dream start to J1 life, the game was a raw demonstration of the spirit of the underdog. Yamagata took the game to Jubilo, even after they had suffered the early injustice of that penalty. They turned it round towards the end of the first half with two goals to go in at the break with the lead. Early in the second half, Yamagata should have gone 3-1 up when Hasegawa was through on the keeper, but he blew it when he tried a cheeky lob. Not long after that, Gilsinho made it all square after a period of sustained Jubilo pressure, but from the 75th minute in, the visitors ran absolute riot through the hapless home team. The complete inability to deal with the height of Hasegawa and Leonard gave Montedio an open invitation to practice their finishing, and more often than not they took it. Witness for yourself the fifth goal here. 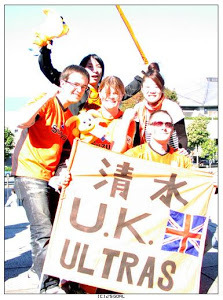 The travelling support (who, by the time they made it home, had covered a cool 700 miles) were in wonderland, and I, as an S-Pulse fan behind enemy lines, just sat back and let it all wash over me. The J. League's been gone too long, and in the opening week I was lucky enough to witness something truly memorable - Jubilo getting hammered, annihilated, destroyed at home by a team many tip to head straight back to J2. Going by today, there's only one team likely to end the season relegated. 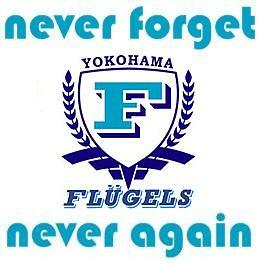 Last year's play off survival may yet prove to have been a mere stay of execution for the blue half of Shizuoka! There was no shortage of goals in the other Saturday games, either. Fellow promotees Hiroshima also battered their opponents, and Niigata put in four away from home to contribute to the 31 goal bonanza. S-Pulse play tomorrow - six away goals would be just fine, please! Last year (which only finished 0-0 after a veeeery close looking off side in our favour at the death) was a bit of a nightmare all round. As if Fujimoto’s season being brought to a premature end wasn’t bad enough, the end-of-the-world style downpour which delayed kick off 90 minutes both tested our patience pre match, and severely reduced our drinking time in Tokyo post match. The not-especially-good memories of Saitama in 2008 are not the reason for missing it this year, though. That’s just down to having Nagoya away in a fortnight to pay for – a game I was making a priority even before the Johnsen factor spiced things up. So this Sunday, we’ve got to be looking to kick the season off with three points. 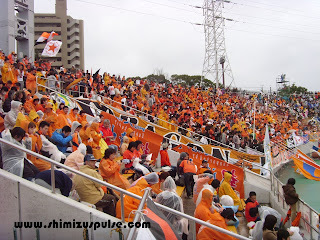 The home and away games with Omiya last campaign were wet, and they both ended 0-0. It's worth noting that both of those matches started with Nishizawa and Yajima leading the charge; both now departed. Each game also saw the introduction from the bench of Aurelio. The less said about him and his uselessness the better. I’m expecting Kenta to start with Okazaki and Johnsen up front as per the pre-season victory over the scum, with Hara and Nagai on the bench. 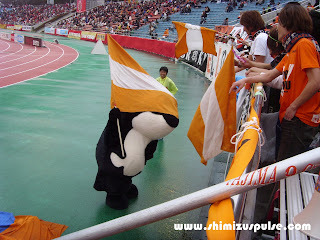 An entirely more threatening prospect to the Omiya goal. Kaito is still first choice between the sticks, and I’d go for Aoyama, Ichikawa, Iwashita and Arata to form the back four. What combination we’ll see in the middle of the park I can’t say. Teru, Edamura and Hyodo are all pretty much certainties, so that just leaves the 4th man. Yamamoto, Paulo or other? Over to you, Kenta. The game is officially sold out, and you can be sure our travelling hoards will fill our end at The Nack5 to roar us on to victory! Three points to start the year, please! J. League is back! 2009 Starts Here! I’ve had a holiday back in England and I've taken up snowboarding. I’ve watched a three hour film or two. I’ve designed a t-shirt and I’ve had root canal surgery on a troublesome molar. I’ve visited the biggest floral clock on planet earth. I’ve read prodigious amounts of literature. I’ve rediscovered the Civilization game series and I’ve converted to Buddhism. So how’s your closed season been? It’s not been easy, but hang on in there folks, the 2009 instalment of the most exciting league in the world is only days away. Amazing J welcome back – we’ve missed you! It was a relatively low key off season all told. There was less transfer activity than in previous years, but for ourselves, not a bad winter break by any stretch. With Johnsen and Nagai coming in to fill the spaces left by the departed Nishizawa and Yajima, we’re equipped this year with a far stronger presence up front, more attacking options, and all-round greater fire power; the lack of which cost us so dearly in 2008. Our meekness in front of goal last year was the difference between not only a Nabisco Cup title, but also an ACL spot. That’s a fact. But what’s also a fact is that over the course of the season, the development of us as a team, and in particular the progress of Okazaki and Hara in the final third, was tangible. In the second half of the season we were the best team in the country. Going by pre-season, Kenta is looking to stick with 4-4-2, which is no bad thing. Paulo’s on top of his game, Edamura is instrumental, Hyodo’s leading the troops as captain and Teru is as essential as ever. Let’s also not forget the huge strides made by Yamamoto and Honda last year. The return of Jungo after that injury at the Omiya Monsoon only adds to our options, but he may have a job ahead of him reclaiming a regular starting spot! We lost Takagi to Gamba, but we’re no pushovers at the back even minus Kazumichi. Aside from defensive regulars Aoyama and Ichikawa, youngster Iwashita has been coming on nicely. He can expect a lot more starts this year, and I’m also looking forward to seeing what new signing Ota is made of. Being a mere supporter, I’m glad it’s not up to me to work out and select the best starting combination from that lot! That’s down to Kenta. It’s just my job to criticise when it goes wrong. ;-) Seriously, though I have faith in our man at the helm to work our newcomers into the team. 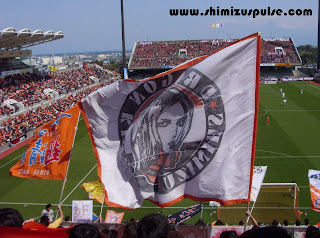 We start our campaign in Saitama with a trip to Omiya. Due to the unfortunate way the fixtures fell (Nagoya away in a fortnight was always high on my list, and as much as I’d like to, I can’t get away with two BDOs in such quick succession!) I’ll be at Dream House watching it on the big screen. 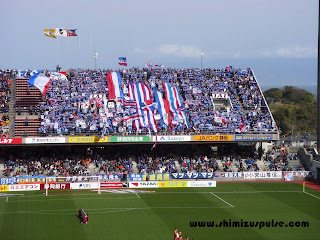 Our first home game is against Marinos, and it won’t be much short of a sell out. Personally, I can’t bloody wait! After that, we squeeze in three more games this month, but it’s at the end of April when it really kicks up a notch. Can we get to five games in two weeks (including a Hiroshima BDO, Urawa at Ecopa and the away derby)? Yes we can! This Saturday, to tide me over till next week, I’ll be heading deep into the countryside to hit the Yamaha. 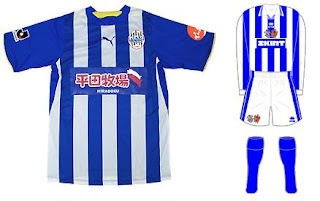 It’s just a happy coincidence that Jubilo's opponents and J1 new boys Yamagata share a common kit with my first footballing love, Brighton and Hove Albion. 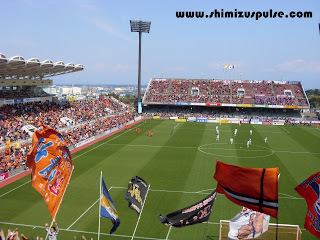 A full round up of all the ins and outs at Nihondaira since the end of the 2008 season. Information correct as of February 3rd 2009. A couple of excellent signings, and some deadwood cleared out. I was sad to see Takagi go, but in the bigger scheme, it looks like Kenta's plan to mould a team of young talent and experienced stars is coming to fruition beautifully. In the last week, both Yamanishi and Toda have announced they're hanging up their boots after being released. Clearly no other club can come close to offering the status gained by pulling on that bright orange shirt, and so they have wisely chosen to call it a day. In all seriousness, I wish them all the very best for the future. After his return from a loan spell at Shonan Bellmare, defender and former young player of the year Toshihide Saito has been transferred to Fujieda MYFC. That's MYFC as in My Football Club. MYFC Fujieda is a supporter funded venture along the lines of the My FC based in the UK. It's the first of its kind in Japan, and given our history as the football heart of the country, its not surprising that Shizuoka should be where it happened. Local lad Saito made 244 appearances for us between 1996 and 2006 and scored 14 goals. In that period he also won 17 full international caps. 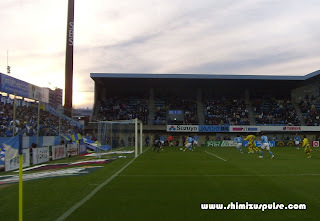 Fujieda, which is just half an hour down the road from Shizuoka, play in the Shizuoka Prefectural League. Saito, one of six S-Pulse players in the J. League's 1999 team of the year, is a legend, and will be missed. Good luck!